When I reviewed PCalc 1.0.2 back in 2008, it was my favorite iPhone scientific calculator, offering all the features I’d ever need with an interface that actually bettered the excellent Mac version. In the intervening year and a half, TLA Systems has dramatically improved the iPhone app, and with version 2.0, PCalc now includes an iPad-native interface in the same package. Given those improvements, and the fact that Apple mysteriously omitted a calculator app from the iPad, PCalc and and its free sibling, PCalc Lite, are more appealing than ever. The current version of PCalc includes all the number-crunching goodness of the version we reviewed back in 2008. You get all the standard scientific-calculator fare, including inverse, roots, exponents, trigonometric functions, nested operations, an RPN (Reverse Polish Notation) mode, and more. There’s a time-stamped virtual tape for revisiting (or even e-mailing) your calculations, as well as a register (called the stack in RPN mode) that displays memory contents and decimal-, hex-, octal-, and binary-base versions of the current number. But TLA Systems has updated PCalc more than a dozen times since our original review, and in addition to various mathematical and operational tweaks and improvements—many of which address minor complaints I had with version 1.0.2—those updates have provided an impressive amount of additional functionality. For example, you can now choose from among nine visual themes and a slew of different key layouts—three vertical and three horizontal on the iPad, and seven vertical and eight horizontal on the iPhone. (The iPad’s larger screen accommodates more keys, so there’s less need for different key layouts with differing subsets of possible keys.) You can also choose one of six (on the iPhone) or five (on the iPad) font styles for the “LCD,” and any of six key-click sounds. Thanks to iPhone OS 3, you can now copy results from the display, and paste numbers into the display for use in calculations. You can also undo and redo multiple actions: on an iPad, you get dedicated Undo and Redo buttons, and on all devices, you can shake to undo or simply swipe your finger across the screen—right to undo or left to redo (although these gestures strike me as backwards). You can also now change the number of lines in PCalc’s display—more lines are especially useful in RPN mode. You can have up to four lines, and the onscreen keys shrink or grow to fit the chosen display size. While you can make such adjustments by delving into the app’s settings screens, the easiest way is, again, to swipe: down the display to add a line, or up to remove a line. Brilliant. PCalc continues to provide convenient access to commonly used scientific and mathematical constants (including, of course, the Ultimate Answer), as well as a conversion feature that lets you quickly convert the current number using scores of functions, in categories ranging from angle to fuel efficiency to weight. Since our original review, TLA Systems has added many new conversions within existing categories, as well as new currency and cooking categories. In total, there are nearly double the number of conversions as before, and the Conversions and Constants menus now conveniently display recently used options at the top. Convert It: PCalc provides more than 150 conversion functions, easily accessible on the iPad via a pop-over. For iPad owners, the most-welcome change in version 2.0 is likely support for the iPad’s larger screen. In addition to being able to display more keys (including the dedicated undo and redo buttons mentioned above), the iPad’s larger screen allows keys to be significantly larger. PCalc on the iPad also takes advantage of iPhone OS’s new pop-over interface elements, letting you access settings, constants, and conversions without having to switch to a different screen. The overall result: better layouts and an interface that’s easier to use than on the iPhone. Which points to the only drawback to PCalc’s iPad interface: It makes PCalc on the iPhone seem small and—with a few of the key layouts, such as Engineering and Programming—a bit crowded. 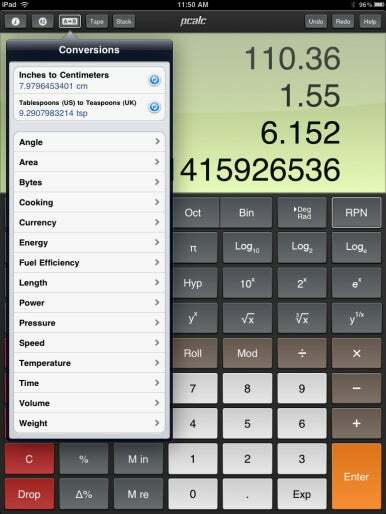 Of course, not everyone needs all these features, nor does everyone want to spend $10 on an iPhone/iPad calculator. So TLA Systems also provides PCalc Lite, a free version that includes both the iPhone- and iPad-optimized interfaces, but gives you only a subset of the full version’s features, constants, and conversions. For many people, PCalc Lite will be more than sufficient, and it’s a no-brainer download if you just wish Apple had included a basic calculator with the iPad. But here’s the twist: If you just want some of the additional features of the full version, you can purchase them a la carte from within PCalc Lite. For example, you can purchase the $1 Theme Pack, which gives you the additional themes, digit styles, and click sounds of the full version. Other options, available for either $1 or $3, include the Conversion Pack (additional conversions and constants), the Engineer Pack (additional layouts and the paper tape), the Programmer Pack (additional layouts and support for hex, octal, and binary), the Multiple Line Pack (multiple memories and display lines), and the Power User Pack (a bunch of settings for fine-tuning how PCalc works). Purchase all the packs and you end up with the full version of PCalc and—don’t tell TLA Systems—you pay only $9.94. What’s perhaps most impressive about PCalc is that TLA Systems has managed to squeeze so much functionality into the program without making it unwieldy; rather, it’s positively fun to use—at least to this calculator geek—especially on the iPad. And the full version of PCalc includes a discount code for $9 off the price of the Mac version of PCalc; if you were thinking of buying the Mac version, this essentially gets you the iPhone/iPad version for a buck. By my calculations, that's a steal.